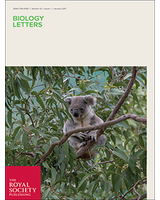 Citation is not yet available for this publication from Biology Letters. It will become available shortly after the publication appears. In Odonata, a direct flight mechanism with specialised tendons evolved. One particular adaptation, the implementation of the rubber-like protein resilin in these cap tendons might be of major importance. Although, resilin was firstly described in one tendon of Odonata, no comprehensive study about the presence of resilin in the thorax exists yet. We investigated various species of Odonata, using µCT, dissection and fluorescence microscopy. Here we show a complete mapping of the odonatan pterothorax, regarding the presence of tendons and their properties. Thus, 20-21 cap tendons in the pterothorax of Odonata show the presence of resilin. While performing outstanding and often aggressive flight manoeuvres, resilin can provide shock absorption against mechanical damage from strong impacts. It may further improve the wear and fatigue resistance due to resilin’s damping behaviour. Additionally, resilin in tendons can absorb and return kinetic energy to restore muscles to their original shape after contracting and help maintaining self-oscillation of the flight muscles. Here the material distribution within the direct flight system of Odonata and the biomechanical importance and possible function of resilin is discussed. These results are an important step towards the understanding of the complex form-material-function interplay of the insect cuticle.